Michael Haneke - a genuine candidate for the greatest living filmmaking - has followed up his brilliant 2009 'epic' The White Ribbon with Amour - a film that is certainly smaller, but no less effective. Veteran French actors Jean-Louis Trintignant and Emmanuelle Riva play Georges and Anne, an elderly, cultured couple enjoying retirement to the best of their abilities. 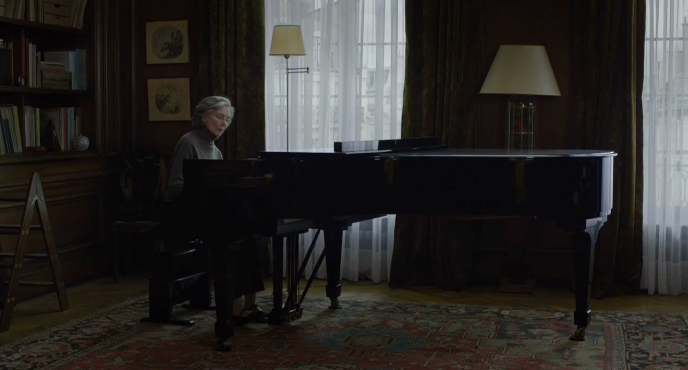 Anne was once a music teacher, and as the film opens they're attending a concert by a former pupil of hers (real-life classical pianist Alexandre Tharaud). All seems well, until Anne suffers a stroke that paralyses one side of her body. Georges commits himself fully to caring for the newly bed-ridden Anne, who makes her husband promise that no matter how bad she gets he is not to commit her to a home or hospital. As Anne's physical condition deteriorates, Georges' earlier assurance becomes a harder promise to keep, especially as their daughter Eva (old Haneke muse Isabelle Huppert working with the director again after sitting out his last few films) desperately pressures Georges to put Anne in full-time care. Amour is one of Haneke's most 'straightforward' films, although that is by no means a cause for conern. While it's not as wrapped up in the layers and layers of social & political contexts that defined his recent masterpieces Hidden or The White Ribbon, the film is as intense and shocking as anything he has yet made - that it's also so graceful and immensely moving is a welcome development. The core narrative is more instantly engaging and rewarding, although there are plenty of subtleties and ambiguities to keep committed viewers occupied long after the credits role. The film boldly opens by pre-empitively revealing the film's tragic dramatic conclusion (although Haneke ultimately leaves a few things up our imagination) - a directorial decision that automatically instills every event that is to follow with a sense of unsettling inevitably. Yet for a director who is often proudly sterile and removed, what's most shocking about Amour is how affectionate and warm it is despite the frequently grim and overpowering tone of the piece. As a relationship study, the film is complex and rewarding. The two main characters have lived together for decades, and their commitment to each other is beautifully captured throughout the film. Without cheap sentimentality, Haneke quickly establishes their existence as a loving, happy couple only to soon set them on a path of physical and mental turmoil. Georges cares for his wife tirelessly - he himself is feeling the effects of old age, but even with the threat of exhaustion he barely leaves her side. Occasionally, he cracks under the pressure - one of the film's most provocative scenes sees him physically lash out for one brief but terrifying moment. But he is selfless in the face of adversity. His wife watches on frustrated, eventually unable to articulate her thoughts as anything other than mumbled nonsense. It's a fascinating and very frequently upsetting dynamic to watch. For the third review in a row, I have nothing but absolute praise for the two lead performances - I think I need to go to see something with actively bad performances to balance things out. Anyway: 85 year-old Riva - once upon a time the elegant lead in Resnais' classic Hiroshima, Mon Amour - is hypnotically great here. Acting out various stages of paralysis, Riva at points manages to communicates her character's desperation and anguish through little more than facial tics and quivers. It's near impossible not to be moved by the commitment of her performance. Trintignant, meanwhile, is equally impressive during numerous emotive exchanges with both Riva and Huppert - desperately attempting not to let his guard down, although occasionally prone to instantly regretted outbursts when it all becomes too much. Huppert has only a handful of scenes, but her verbal sparring with Trintignant and her emotional responses to Riva's sad decline impress. This film is a triumphant example of actors completely owning the material. 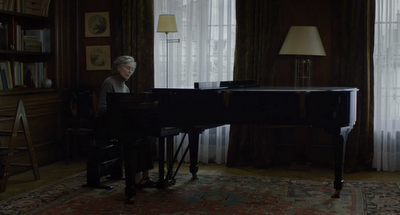 Haneke, meanwhile, plays things relatively straight stylistically. The film has only completely diegetic music, even though music plays a vital part in the story. It's a worthy commitment, ensuring none of the film's emotional payoffs feel cheaply won. The film is shot by veteran DP Darius Khondji, and himself and Haneke make wonderful use out of the confined apartment where most of the 'action' (if we can call it that) takes place. Apart from a few cheekily framed shots near the beginning (a static wide angle in a concert hall somewhat recalling that infamous final shot from Caché) the film doesn't engage in much visual trickery. Haneke cuts from shot to shot and scene to scene with relative urgency - urgent for Michael Haneke, anyway - although the camera lingers for extended takes when the performances demand it. The most unexpected directorial flourish comes in the form of a trio of semi-fantastical tangents - two visits from a winged intruder, an unsettling nightmare and - most poignantly - a beautiful interlude in which Georges remembers or imagines Anne able-bodied and playing piano. They're expertly crafted into a film that is otherwise committed to a raw and realistic aesthetic. These surreal additions enhance rather that distract. Accessible might be too strong a word for Amour, but it's a film most will find themselves completely drawn into and deeply moved by. It's proudly unrushed but endlessly involving. The general subject matter has been tackled before - recently enough in Sarah Polley's excellent Away From Her - but in Haneke's hands the themes and issues seem vital and insightful again. This is another astonishing work from Austria's greatest cinematic export.